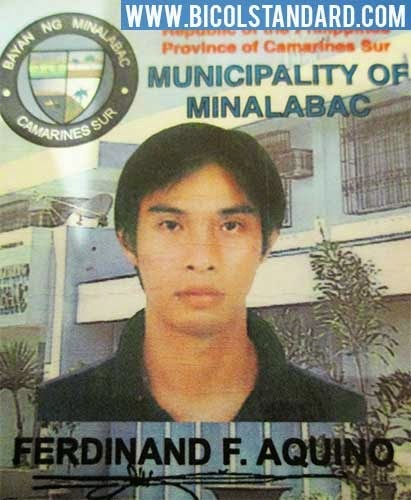 MINALABAC, CAMARINES SUR—The tear-streaked wife of missing LGU Minalabac engineer Ferdinand F. Aquino has already appealed to the National Bureau of Investigation (NBI) for help in locating her husband who has been missing since Saturday, July 12. Mrs. Mercy Valencia-Aquino, Engr. Aquino’s spouse, sent a letter to Atty. Tomas Enrile, NBI Director for Region V, narrating the details prior to her husband’s disappearance. The letter, which was dated July 18, Friday, was shared to the local media this morning via Kapisanan ng mga Brodkaster ng Pilipinas (KBP) Camarines Sur chairman Edwin Lara. In the letter, Mrs. Aquino said that her husband left their home at around 10:00 in the morning on July 12 to finish his work in his office at LGU Minalabac. She further recalled that in the evening of said date, she and her husband had been exchanging text messages in which she asked that he come home. Engr. Aquino said that he still had to finish his work, but assured his wife that he would come home later. She waited in vain. On Sunday, July 13, however, they exchanged text messages again. Engr. Aquino promised that he will be home before dark. Mrs. Aquino said that she tried calling him on his cellphone, but could not reach him. The next day, July 14, Mrs. Aquino went to her husband’s office to look for him. She was told that Engr. Aquino was allegedly seen by a co-employee along Magsaysay Avenue the night before. Days passed without any news of the whereabouts of Engr. Aquino. As Typhoon Glenda was battering the Bicol region, Mrs. Aquino was growing desperate to find her husband. She informed Engr. Aquino’s parents, who reside in Tarlac, that their son did not come home. Alarmed, they travelled to Bicol, braving Typhoon Glenda. Together with her in-laws, Mrs. Aquino tried to look for clues about where her husband could be. She also sought assistance from the Mayor’s Office and the Minalabac Municipal Police Station. To date, it has been almost two weeks since Engr. Aquino was reported missing. This morning, Mrs. Aquino and her in-laws went to KBP Chairman Edwin Lara to request for an opportunity to be interviewed on radio and TV and ask for the public’s help in locating Engr. Aquino.